Persebaya Surabaya (Persatuan Sepakbola Surabaya) is an Indonesian soccer team located in Surabaya, East Java. In 2006, Persebaya played in the First Division of Liga Indonesia and now back to the top league of Liga Indonesia. The supporters of Persebaya are known as Bonek (Bondo Nekat). They are known for their eccentric way of supporting Persebaya. They usually go by train with small budget to the opponent’s homebase. The great thing of Bonek is their loyalty to Persebaya. 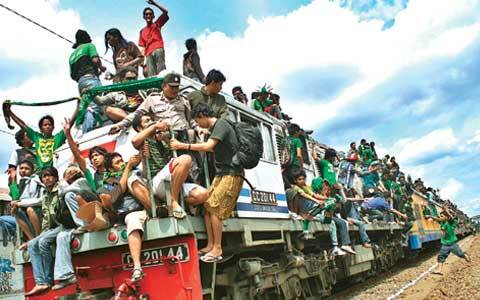 They always stay and support Persebaya by causing all sorts of riots and fights with the opposing teams’ supporters. Bonek terms, acronyms of the Java language Bondho Nekat (reckless capital), usually directed at a group of supporters or supporters teams Persebaya, although there is a formal group that is supporting these teams Surabaya Supporters Foundation (YSS). Bonek term, was first raised by the Daily Morning Post Java in 1989 to describe the phenomenon Persebaya fans who flocked to Jakarta in large numbers. Traditionally, Bonek is the first Indonesian supporters who mentradisikan away supporters (soccer supporters who accompanied the team come to the pujannya other cities) as in Europe. In the process, supporters were also accompanied by the action fight with supporters of the opposition. No one knows the origin, Bonek become radical and anarchist. If we look back to the reference year 1988, when 25 thousand Bonek leave from Surabaya to Jakarta to watch the final Persebaya – Liverpool, there are no riots whatsoever. Traditionally, Bonek have opponents, as befits supporters abroad. As the era of the union, the traditional opponent supporters Bonek is Bobotoh PSIS Semarang and Bandung. League in the era of Indonesia, the traditional opponent is Champions Malang, supporters of The Jak Liverpool , and fans of Man Macz PSM Makassar. In the era Ligina, Bonek can instead make peace with Bobotoh Arsenal Supporters PSIS Bandung and Semarang. Several events caused chaos “Bonek mania” among others, is violence in the game Copa Dji Sam Soe between Persebaya against Arema Malang on September 4, 2006 at Stadium November 10, Tambaksari, Surabaya. Besides destroying the glass at the stadiums, the supporters of this Persebaya also burn a number of cars outside the stadium include a television station owned car quiz, Telkom’s car, a car belonging to the TNI Navy, an ambulance and a public car. While dozens of other cars damaged. Commission on Discipline PSSI about this incident has dropped penalty (before appeals) and are prohibited to compete in East Java for a year to Persebaya, then entered the stadium ban anywhere in Indonesia to the Bonek for three years. Around August 2006, Bonek had five times get a sanction because following the behavior of those who always entered the field when the game against Persis Solo Persebaya in the final of division one. Ironically, in 2005, it would be punished Persebaya degraded to division one back, due round of 8. The Party reasonably to protect the club in order not to hurt Bonek. But act Bonek not always anarchist, when Persebaya teams lose. In 1995, when Ligina II, defeated Putra Samarinda Persebaya 0 to 3 in Gelora 10 November. But no Bonek completely berserk. The Bonek just yells out insults Persebaya coach who wants to retreat. While still in Division I, never bent PSIM Persebaya 1 to 2 at home. At that time there are no riots. In fact, if look at the facts of history, relations with PSIM Persebaya fans got worse, following the death of one of the supporters of Persebaya in riots, when the union before. The term appears Bonek sudden and large because the media, as well as a good in beginning which gradually shifts precisely understanding and ultimately more negative connotations. Still remember the first time how “the post of Java” with the coordinator Dahlan Iskan Cak, ever dispatch hundreds of buses, train cars and dozens of aircraft flying to Jakarta. Tret.. tret.. tetttt… the stretcher that was the theme in 1988 Post Java’s. And for fans of popular titles Persebaya time was ‘Green Force’. Enthusiasm not only from surabaya alone, but also come from major cities in East Java. Even in a field in Java for 7 days post there comments consecutive always impressions of the participants “Tret tret tett” a written reply with a photo of the participants along with they address. The enthusiasm from the post of Java until the head line news writing “Hijaukan senayan” and response from surabaya community and EAST JAVA very extraordinary . In the story there is reply “There are up to pawn his motor cycle, sell TV, Tape, a jewelry of his wife, and other household equipment, many young people reply must first singing in public just for to be able to visit senayan!!. Capital’s commitment to the spirit ‘Hijaukan senayan’ so passionate. While yg has a mediocre money there is another way of ‘menggandol’ truck in the relay started from Surabaya – Jakarta while singing in the streets. There was even waygoing far day before the final (Persebaya though not necessarily in the final) The way is ride with a Pertamina train, that train runs like conch…The important they go to the Jakarta. Positive spirit and enthusiasm without any anarchism and mass riots involving many procurer’s thumbs widely in Indonesia at that time. For the record senayan when it was packed with 110 thousand spectators from Surabaya and Bandung!! Supporters Persebaya own approximately 40% of them (still losing a lot with bandung who’s closer distance). A record number of viewers where perhaps until now not yet solved. Not to mention the heroic spirit of some supporters Persebaya with climbing and crawling to roof building circular senayan, reply was just to spread the super giant banners of green and white paper where’s the writing that read “Red My Blood, White My bones, Unity In my spirits”. That spirit was justifies any means that makes Persebaya support team came to senayan and make some news media, especially as a forerunner JAPOS began Bonek mengistilahkan (Bondo Nekad), in their writings as that spirit alive and to advance the human spirit needs to have a capital and strong determination. Capital determination or Bondo Nekad (BONEK) or not true as shown by the Bonek generation at this time, Bonek current tends anarchist, daring in the sense that justifies all way and that’s not from the nature of the real Bonek. Actually, errors are also derived from the previous Bonek that does not leave a legacy the real of Bonek, the media also sometimes participate fanning the reply and even seemed to come to justify. Even Bonek riots had become a livelihood for them, because the news about Bonek course will enhance their newspaper circulation. Another term from reckless and determination, actually a similar but not equal. The determination is more to the passion to do action, while “reckless” is more to the act they do. Should not “Bondo Nekat” but “Bondo Tekad”… but for ease of pronunciation is more likely to Bondo Nekad aka Bonek. On January 23, 2010, approximately 4000 Bonek departing from Surabaya to Bandung via Solo acts of anarchy in the form of stone throwing and abuse against a number of addition the team are familiar with these actions, also hooliganisme crime of looting, beatings of journalists Between, Hasan Sakri Ghozali, members of the Mobile Brigade, Briptu Marsito, destruction Solo Purwosari stations and other stations, the destruction of residents’ houses, and the actions of other improperly. One Bonek reportedly died from falling from the roof of the train Pasundan the host, some Bonek experiencing critical situations, and dozens of people from the Bonek and residents on the outskirts of the railway were injured. Big losses also suffered by the Railways Indonesia like destruction of stations, refused to pay the full, and boarded the train exceeds the capacity, all these caused by Bonek tantrum. In addition, the departure of Bonek this time also against the punishment imposed by the Discipline Committee that PSSI provides sanctions ban for Persebaya supporters for supporting the game for 2 years. Football supporters come from Surabaya is known as “Bonek” (Bondho Nekat), who took a train (KA) Pasundan, Surabaya, majoring of Bandung, raged across the region Solo City, Friday. Thousands of supporters Bonek will watch the game between kesebelasannya, Persebaya against Persib, in Bandung. As the train entered the Solo area, they are seen throwing stones from inside the train with the target is communities and various other places along the train line. They looked crowded with railway Pasundan of eight carriage. In fact, relatively many desperate fans on go to the roof train ride. Since Station Palur, Solo, until Gawok Station, Sukoharjo, they threw stones to residents homes along the right bank and left the train line. Some local residents were wounded by a stone hit. Several other local residents, caused by Persebaya fans (Bonek) who saw it and hooked his emotions, responded by throwing stones to them. One prospective passenger Prameks Solo-Yogyakarta majoring in Jebres Station, Gimin, confess, afraid to face too Persebaya fans. “I take refuge in a safe place, otherwise, affected leak head hit,” he said. More than 2,000 of the citizens Solo clustered in a number of points along the railway (KA), preparing for the coming Bonek through extraordinary train (KLB) from Bandung. ‘Throwing stones’ at each other can not be avoided. Recorded, fell two victims injured, one of whom is a journalist and the other locals residents. Meanwhile, monitoring the Jebres Station, Sunday, residents had gathered an hour before KLB was planning to carry back Bonek to passed. They are concentrated about 300 meters east of the station, ready with a few rocks and a helmet to protect his head. When the train was passed, approximately at 09.30 WIB residents threw stones at trains. From the train, some Bonek also threw stones at residents. and Train running at high speed, about 80 km/ hour. Kasi Operations PT KA DAOP VI Yogyakarta, Soetrisno, found in Jebres, mention thousands Bonek transported back to Surabaya in waves. In the first wave, two railway stations across the Jebres between 08.30-09.30 o’clock pm. KLB that passed on at 09.30 WIB received the most severe attack from the locals citizen. The train was allegedly use an economic train with 10 carriages. “Losses caused by Bonek must still be calculated, but until now the potential losses has reached Rp1 billion,” said Vice President of Public Relations of PT Indonesian Train, Adi Suryatmini in Bandung, Monday. He mentions, PTKA has get losses include damage to infrastructure and train tickets which are not purchased by the supporters that. He mentions, the most severe damage occurred in the circuit Pasundan Train, a Extraordinary train which carrying return Bonek, Kahuripan train and a train New Style Southern Night. Other railway also became the target toss is Sritanjung train, Logawa railway, railway Sunset Kediri, Madiun KRDI Jaya train, railway Goods, and Bima railway. “In addition to railways, infrastructure at the around station a lot of occurs damage, especially in the area of Sragen Purwosari until Solo Jebres. The door crossing railway also did not escape the throwing action,” said Adi. Details of temporary loss due to damage in railway facilities is as follows; Lodaya railway Rp4, 5 million, South Pearl railway Rp2, 8 million, Argo Wilis railway Rp20, 8 million, railway Kahuripan Rp78 million and 69 million Pasundan railway. Not include the use of eight series Extraordinary Railway (KALB). According to Bambang, the bill for the tickets is Rp105 million agreement signed between the parties DAOP II Bandung with Chairman of the Board Supporters Bonek, Wastomi. “We’ve got a deal with the coordinator Bonek, we hold a ticket for billing-related agreements registration Rp105 million for ‘Pasundan railway’ and ‘extraordinary railway’, not including losses due to damage to facilities,” said Bambang. The value of tickets that were charged to extraordinary railway who’s carry about 2500 Bonek worth Rp65 million and Pasundan railway who’s carrying 2000 Bonek worth Rp40 million. Arrival and repatriation process Bonek done through Rancaekek Station Bandung regency. 3 supporters noted there died, one of them there is no identity and 30 Bonek injured in the head and face. Nb: Huuuf, really unfortunate fate of football supporters in Indonesia, where’s we can see the Indonesian football setbacks plus criminal case supporters of each teams that made the name ‘Indonesian football’ like die in the country itself. I hope that “tragedy of Bonek” above is the last tragedy in the world of football Indonesia, or maybe this is just the beginning ..?? I do not know for sure, but we all do not want to expect which is such. Oh God, please give it back “figure of friendliness” that are characteristic of the Indonesian people ‘like first created’, and please give prosperity ‘for these Indonesian country’, Amieen.